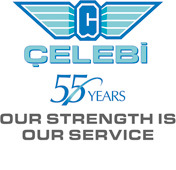 Çelebi decided for its slogan: "OUR STRENGTH IS OUR SERVICE"
In the run-up to celebrations commemorating Çelebi’s 55th year in business, Çelebi Holding organized a contest to identify a new slogan that would sum up the company’s vision, mission, service approach, and goals. The contest commenced with its announcement to Çelebi personnel on October 15th. The contest, which ended on November 16th, attracted considerable interest among Çelebi personnel worldwide. A total of 606 slogan ideas were submitted by Çelebi employees. Working with an advertising agency, these submissions were repeatedly reviewed and assessed in light of specified requirements, with their number being reduced first to 200, then to 100, and finally to 33. These were then considered from the standpoint of their compatibility with principles, objectives, and mission & vision statements previously announced by the group on various occasions as well as in terms of their usefulness as advertising messages, logos, etc. Eleven slogans were identified for submission to the Executive Committee, which voted on them. Three that received no votes or very few votes were eliminated, leaving eight. The winning slogan, which emerged from the final round of voting, were announced at a New Year’s party held at Çelebi Holding Headquarters on December 27th.